A lone tower stood on a forgotten hill, its crumbling walls choked with creeping ivy and lichen. A mouse scratched away at the mortar at the base of the tower to widen the portal into its home. It paused momentarily as a solitary barn owl winged by on a late night hunt. The hill began to quiver as wild energy rose from deep beneath the ground and swirled up through the tower’s foundations. Ancient wards, long worn from the passing of ages, snapped and fizzled out of existence. Power snaked through stone, making the edifice thrum to the luminescent tattoo of white fire. Fearing the approach of a predator, the mouse bolted down its hole to a fiery death. A beam of blue energy surged out from the battlements into the night, rupturing the sky with a halo of clouds and lightning, pursued by the wailing howl of disturbed winds. A blackness tore a gash in the starry night. The beam subsided but the tower continued to smoulder like a dying ember. The darkness rippled as a host of meteorites shot forth from the rift, burning yellow-green as they separated, spearing towards the ground, trailing stardust. The sky boomed angrily as the meteorites screamed over the tower and ploughed into the hillside, throwing up sheets of earth. A thick forearm, covered with tufts of white fur, reached out from one of the newly formed craters. A three digit hand, ending in thick, cracked nails, dug into the singed grass. A second arm followed as the traveller struggled to escape the steaming embrace of its cocoon. The traveller lay panting, his close-set eyes and wide snout weeping uncontrollably. His lungs burned with the effort to separate oxygen from the toxic air. His arms, proportionately longer and thicker than his legs, felt as if they were being forcibly held down. Even his tough hide seemed to be galvanised by this planet’s atmosphere. Spasms gripped his limbs and chest like the jaws of a nicor, the land-bound dragons of his home-world. The alien sounds of the new planet laid siege to his protesting ears. Layers of noise compounded together into a constant roar. He reached for his axe as something large flew by above him; fire flashing under its wings and its wail resonated for miles around. Far below him smaller armoured creatures moved in a train across an inky river, their eyes projecting a wash of amber luminance. Beyond the hill a deep valley cupped a number of small settlements with firelights webbing back and forth across them. On the horizon, the first ray of daylight warmed the sky. The traveller shielded his eyes from the glare and cast about the hillside looking for members of his warband. Shakily, he raised himself onto his feet. Some of them had managed to extract themselves and now lay on the grass, like beached sea-mammals. He needed to get them together and move them into the tower. By the time he had located all of his warriors, the sun had crested the distant moors. This world had an older sun, but despite its pitiful size, its yellow rays were burning his exposed flesh. The traveller swathed himself with his oil-cloth. Ten of his warband were strong enough to walk. The other four survivors were too feeble to make the short trek to the tower. Normally, he would have cut their throats to end their misery. He had no room in his unit for weaklings. But the traveller could ill afford to squander his resources. Already six of his command lay splattered about the hillside. ‘Get those grunts into the tower,’ he called to the more able-bodied warriors. ‘Vasch, what of our dead?’ asked one of his comrades as they entered the tower, his nostrils flaring and his green eyes glimmering at the prospect of meat. The one called Grenld shook his head sullenly, his face already covered in sores from exposure. Vasch strode to the back of the circular room. Udulf, a big bruiser who had recently joined his unit, stared at him with unfriendly eyes. Vasch would have to watch for him. Vasch dropped his gear onto the floor and settled down under the sweep of the stairs, out of Udulf’s line of sight. From inside his leather hauberk, he drew out a glass bauble. It was the size of a rook’s egg, inscribed with frosted symbols just beneath the surface. He held it gingerly before his face. It began to softly pulse red, almost making him drop the damn thing. Something invisible reached out from within the orb to examine his face with a fluttering caress. Vasch’s lip curled back over his tusk in revulsion. Magic was for goblins. If the Trollking hadn’t been so specific about keeping the bauble safe, he would have smashed it with his axe. Despite his revulsion, Vasch peered closely at the orb as an image began to form within the pearlescent shell; a human child with straw coloured hair and blue eyes. The child would soon die by Vasch’s hands. Nathan Celic stood before a mirror looking dejectedly at the slight bulge of his stomach against his top. He pulled his jeans a little higher up his midriff, choosing to ignore the fact that his wide belt and buckle were cutting into his skin. ‘Logan! Bro, we’re running out of time. Get her to hurry up, will you?’ he called. His brother grunted from behind a stack of old books on a counter. They were in an antique shop, picking up Logan’s girlfriend, Katrina. The place smelt of musty books and old things. Her granddad, a scrawny World War II veteran with a white, walrus moustache and thick prescription glasses, stood behind the till. Nathan could feel the old guy’s eyes follow him around the room. Nathan pushed his black hair behind his ear and scowled. Logan had been going steady with Katrina for nearly a year now. The brothers had been in this shop at least a hundred times, but still the codger watched them as if they were convicted criminals. Had this been any other shop, Nathan would have seriously contemplated throwing a brick through the window. Hoodlum and vagrant they had labelled him, ever since he’d turned eight. Adults questioned his right to stand on a street corner or to hang out in a playground. The way he walked and dressed were reasons to condemn him. Their stares nettled him to want to do what they already accused him of. ‘What’s taking her so long?’ he groused to Logan. ‘I have to look good for my boy,’ said Katrina as she parted the beaded curtain that divided the shop front from the house. She twirled on the spot for Logan’s benefit, wearing a low-cut crop top and trousers. Her large green eyes, diminutive nose and raven bob made her look like a manga character. ‘Granddad, I’ve left a slice of pie in the oven for your lunch. The timer is already set. You just need to hit the “start” button when you want to eat it. I should be back by teatime,’ called Katrina as Logan led her to the door. Katrina’s granddad nodded absentmindedly while keeping his eyes on Nathan. Nathan stuck up a finger at the old coot behind Katrina’s back. The old man responded with an equally rude gesture of his own. Nathan grinned despite himself. The three walked several blocks to the more affluent part of town. Georgian terrace houses and corner pubs gave way to large semi-detached Victorians and green areas. They were supposed to meet up with Salina, Nathan’s girlfriend, at the bus-shelter around the corner from her mum’s place. Salina’s mother didn’t approve of her daughter’s association with Nathan. Nathan caught sight of her when they were still half a block away. She had wavy, golden hair, with eyes bluer than the sky and a smile that did funny things to his stomach. But then he noticed her geeky brother, Adam, beside her. Salina spotted them and waved. ‘What’s he doing here?’ asked Nathan as they drew close enough not to have to shout. ‘Home, perhaps? Go on, bugger off home, Adam. You’re not old enough to come with us,’ said Nathan, shoving Adam back in the direction of his street. ‘Leave him alone. If he doesn’t go, neither can I,’ said Salina testily. Nathan draped a conciliatory arm over her shoulders but she pulled away from him. He glared at Adam, who caught the look and stepped closer to his sister. Adam stared out of the greasy window of the 313 bus. Suburbia rolled on by, giving way to the verdant rolling landscape of the Pennine countryside. Adam imagined wolves and bears roaming around in the thickly wooded hills, though he knew that badgers were the largest predator in these parts. The bus deposited them at a lonely stop on a winding road. Adam strained to hear the comforting sound of passing traffic as they climbed over a stile. They cut through a farmer’s field to a public footpath, which led them into the wood. They hiked for about an hour along a trail that ran parallel to a wide stream. Occasionally, the alders thinned enough for them to see a picturesque town that had escaped industrialisation, nestled in the valley below. The arches of a railway viaduct cut across the valley like a brick leviathan. Adam was finding it difficult to keep up with the others. ‘Can you guys slow down a little? I’ve got a stitch,’ said Adam, already out of breath. ‘I told you it was a mistake bringing him along,’ grumbled Nathan. ‘Lay off him, Nathan,’ said Logan as he slowed his pace to allow Adam to catch up. Adam sighed as Nathan threw him yet another evil look over his shoulder. Eventually, they encountered the source of the stream, a lake that meandered for a mile along the moors. To Adam’s embarrassment, the girls began to undress. The Celic brothers disappeared behind a bush to change into their trunks. Adam turned away as the girls pulled off their tops and concentrated really hard on the lake itself. The far shore was heavily bearded with beech, birch and holly trees. The mountain ash and sessile oaks on their side grew further apart, allowing the golden rays of sunlight to touch the bluebells and the bracken that braved the woodland floor. An ancient oak, with craggy bark and thick boughs, grew close enough to the shoreline for it to reach out over the lake with its twisted limbs. A faded blue rope hung suspended from a branch two thirds of the way up the tree. Adam watched in awe as Katrina, dressed in a one-piece swimsuit, climbed up the tree, making it look easy. She clambered up until she could grab the rope and then swung out into space, letting go as she hit the apex. Katrina dropped into the water with a squeal of joy. Adam sighed in wonder. Nathan went next, then Logan and finally, even Salina scaled the tree, ululating like Tarzan as she sailed through the air. Finally, Adam found himself in the predicament of being the only one still standing on the shore. The sun grew warmer on Adam’s back as he planned his route up the oak. Behind him, Salina splashed water on Nathan; shrieking with laughter as he splashed back. The other two shouted out encouragements at the combatants. ‘Yeah, Adam, it’s much too dangerous for a little tyke like you. Just slip into the water now,’ added Nathan. ‘Nathan, stop acting like a prat,’ said Logan. Adam looked back over his shoulder, squinting through the sun’s glare. They were watching to see what he would do next, except Katrina who floated placidly on her back. Adam suddenly felt unbearably warm and flustered. ‘I knew he wouldn’t climb,’ said Nathan with a smirk. Adam felt like running into the water and knocking the sneer off Nathan’s face. Nathan was big, like his brother, with wide shoulders and big arms. He wasn’t as athletic as Logan, unless you counted throwing eleven year olds into wheelie-bins as a sport. Adam didn’t know what his sister saw in him. Nathan had greasy hair and his ‘goatee’ barely passed for fuzz. Why couldn’t she have gone out with Logan instead? He was slimmer than Nathan, good looking and popular at school. Adam rested his hands on the tree, feeling the texture of its cracked bark, trying to draw strength from its sturdy trunk. He pulled himself up onto the first branch. The others fell silent as he laboured his way up. At one point, he developed a cramp in his foot and had to wait in agony as it worked its way out. Finally, he pulled himself onto the last bough and inched out until he was directly beneath the rope. Only then did he realise that the rope was out of his reach. Why mum had to send him with Salina was beyond him, thought Adam, recalling the big row they had over breakfast. He would have been happier in front of his games-console, playing through campaign mode on Horizon Commando 2. Even Salina hadn’t wanted him to come. Who the hell climbed trees nowadays anyway? This was definitely Salina’s fault. She should have buggered off before mum woke up. Adam looked down at the four treading water below him, psyching himself up for the ridicule that would surely follow. Luckily, they seemed more concerned with something happening further out in the lake. He sighed in relief and began to make his way back down. ‘What is that?’ he heard Katrina ask. He paused to gape at the phenomenon that had captivated the others. Lights shimmered under the lake’s surface, forming a queasy pattern that left Adam cross-eyed. The water above the lights bubbled as large pockets of air exploded into white froth. Salina edged towards the shore. Adam wasn’t that far off the ground now but he found his eyes drawn to a depression at the centre of the light-show, increasing in size and momentum. ‘Salina, get out of the water,’ he said urgently. The water began to funnel inwards. Salina’s gaze snapped away from the lake and turned to Adam. Her eyes were large and round with terror. She raised a hand towards him. Adam leapt to the ground but landed badly. The shock rode up to his groin, making him wince. The water drew away from the banks and into the gaping maw of the vortex. Adam reached out desperately for his sister’s hand, scared to enter the water. Her fingers strained towards his. The whirlpool ripped her away from him. Salina and Nathan were swimming hard against the current as the vortex continued to reel them in to its maw. Adam continued to watch in horror as Katrina disappeared below the surface. Nathan shouted something at him as the whirlpool swung him past Adam. Adam ran to his sister’s handbag and pulled out her mobile phone. He fumbled with the lockscreen as Logan went under too. Adam dialled the emergency services number and then looked back at the lake. Nathan went next. A voice spoke urgently into his ear. Only Salina remained visible. He couldn’t remember speaking, but the voice reassured him that help was on the way. The brushed aluminium casing slipped through his nerveless fingers and the phone fell onto his sister’s neatly folded jeans. Salina screamed. Adam waded out into the shallows but hesitated when he felt the pull of the undertow. ‘Oh, God, please don’t make me do this. Let them be okay now, please, let them be okay,’ he pleaded through his tears. The funnel had begun to collapse in on itself. Adam splashed forwards again, only to lose his footing as the lake-bed suddenly dropped away beneath him. Water closed in over his head and filled his mouth and nose. Panicking, he flapped his arms wildly, trying to claw his way back to the surface. A snarl of energy snaked out and snagged his leg, pulling him relentlessly towards the core of the vortex. A frisson of pure fear coiled around his stomach. Prayers tumbled unbidden from his lips. The surface lifted away from him. He couldn’t breathe. Something awoke deep inside him. Darkness wriggled up his chest, like a parasite that had grown within his gut and now sought a way to escape his body. Adam braced himself as the sinister force lashed out. Suddenly he was free. He broke the surface, spluttering hard, his body wracked with spasms as his lungs sought to clear themselves. Strong hands grabbed him from behind and pulled him back to shore. His saviour deposited him in the shallows and forced his eyes open. ‘Are you okay, kid?’ asked the voice of a stranger. ‘I’m fine. My sister is still in there. So are my friends. Please, help them,’ said Adam, coughing out more water. The man nodded and ran back into the lake. Adam continued his vigil with his knees drawn up to his chest for warmth. Steam rose from him as the sun dried his clothes, but Adam continued to shiver. The cold emanated from inside him. Minutes went by but the man did not resurface. Eventually, he heard the thumping of helicopter blades drawing closer. Salina’s phone rang but Adam ignored it. He watched as the funnel finally disappeared in a wash of bubbles as the helicopter descended from above. Prince Sultan rode around a sandy paddock on the back of his father’s latest purchase, an Arabian thoroughbred. He held a short Indian lance, aiming it at a wood and leather mannequin. His father, Shah Suleiman of Azamabad, stood at the paddock gates carefully observing his performance. A small retinue of guests, advisors and guards stood behind the Shah. Amongst them was a gangly, square-jawed Englishman, recently come to Hindustan with the East India Company. He had arrived in Suleiman’s court just a few days ago with a letter from the Mughal Emperor, Akbar. The letter strongly requested that the Englishman be accommodated in his endeavour to study the flora and fauna of Northern India. Sultan’s father had so far avoided giving an audience to the Englishman. He knew this because his father insisted on discussing the kingdom’s business with Sultan. ‘Karram Singh. That will do. The foal is a good purchase, don’t you agree?’ asked Suleiman of the horse master. ‘Yes, Your Majesty, it is an excellent purchase. And I think young highness is quite taken with him too,’ replied the horse master. Sultan sighed in exasperation as the huge man from the Punjab province strode across the sand. Sultan considered charging at him with the padded lance. Karram Singh smiled as if he knew exactly what the prince was thinking. ‘You must study as well as learn to ride, Sultan,’ said Suleiman. ‘That is true, but a land is not maintained with a sword and people are not fed by princes riding on horses,’ said his father with a laugh. The Englishman marched forward with a vigorous stride. He didn’t much look like a man given to study. ‘Honesty. That is a good sign, Williams. It means we may get along yet. ‘The French and the Germans are making great leaps in their musket designs. I hear that the Germans have muskets with the flint loaded on a sprung arm and that the French are trying to improve the mechanism of the striking surface and flash pan. I foresee that conflict in the future will not be decided by how skilful one’s swordsmen are, but by how advanced one’s firearms are. ‘That is a most generous offer, Your Majesty, but might I suggest . . .’ began Williams. As of that day, Hubert Williams gained a protégé and assistant. When Sultan wasn’t practising horse riding, archery, swordplay or shooting, he wandered amongst the woods and parks in and around Azamabad. He carried cages and jars for Williams, made notes on scraps of parchment and repeated sentences in several languages. Always, wherever they went, a retinue of armed guards followed. Once Williams had Sultan draw a sketch of a weed growing at the base of the city walls, while he himself sketched a creeping vine. Shah Suleiman appeared on the parapets above. Williams remained in the court of Azamabad for a full year before he was given leave to return to Delhi. Sultan’s father had been greatly displeased with this arrangement but did not hinder the Englishman’s journey. Akbar had personally requested his presence. By this time Sultan had developed a good command of the Western languages and had acquired a deep appreciation of the province’s flora and fauna. His father, however, fell into a dark mood and began to spend long hours with his advisors and generals. Unused to being excluded from important meetings, Sultan spent his newfound freedom by looking for ways to sneak into his father’s study and eavesdrop. His father, however, had an uncanny knack for knowing exactly where to find Sultan, at which point he would be dispatched to the family wing. There he was subjected to the art of personal hygiene. A long bath, a change of clothes, hair oiled and brushed and then forced to partake in a meal. Sultan took to loitering around the training grounds to watch the soldiers drilling and practising armed and unarmed combat. Sultan tried to convince the soldiers to spar with him too. In the past, two soldiers had been discharged from active duty for having accidentally struck the prince. Another had ended up in the hospital wing with his head bandaged when the enthusiastic prince had gotten the better of him. The guards had learnt their lesson. Three weeks after the departure of Williams, an old man dressed in a long white tunic and turban, leaning on a knotted staff, arrived at the palace gates. He did not speak a word, but stood waiting patiently. Eventually, news of this stranger’s presence reached the Shah. Suleiman descended to the gates, followed by his first wife, Princess Gulbadan, Sultan and the usual cadre of aides, advisors and guards. The watchmen at the gates saluted smartly as the royal family approached. The old man watched from under his bushy eyebrows, stroking his long white beard. When they drew closer, the Princess Gulbadan exclaimed softly and stepped close to the Shah to whisper in his ear. He nodded and whispered something back before turning to address the old man. ‘Peace, mercy and blessings upon you, Sheikh Inayatullah. It would bring great honour to my humble home if you would kindly permit me to be your host and offer you food, water and shelter,’ said Suleiman. Suleiman gestured with his hand for the Sheikh to enter. The old man moved forward slowly as if the very act of walking caused him agony, though no sign of pain showed on his face. Suleiman fell in step with the Sheikh and the rest of the procession followed in their wake. ‘Who is that man?’ asked Sultan. ‘Sheikh Inayatullah is a very pious saint. I went to speak to him after your sister Gulzarin was born and he told me about you,’ replied Gulbadan. The Sultan threw a feast for all the poor of Azamabad that evening, though the poor of Azamabad were considerably wealthier than many merchants in other provinces. The city’s finest poets sang couplets and religious ghazls. They were followed by acrobats and jesters for the entertainment of the common-folk. All the while, Suleiman spoke quietly to the Sheikh, seated on a series of cushions arranged at the foot of the throne. Sultan couldn’t make out what they were saying, so instead he watched the acrobats form a human pyramid. Later that night, as Sultan was being chased around his bedchamber by servants trying to get him ready for bed, his father strode into the marble-clad room. Immediately, Sultan slid to halt with a sheepish grin. Suleiman smiled indulgently. The servants used the opportunity to pounce, dressing him quickly as he stood checked by his father’s gaze. ‘I see you have been behaving as befits your station,’ remarked Suleiman. Sultan nodded his head vigorously even as one of the servants tried to brush the knots out of his tangled hair. After delivering this revelation, his father spent an hour with him, relating to him stories of djinns, sorcerers and flying carpets. But when Sultan finally slept, he didn’t dream of magic carpets and princesses. He dreamt instead of a faraway land, of a jewelled city and blue-grey mountains. Adam waited until his mother had locked the front door before announcing that he was going to his room. ‘Do you want me to make you a sandwich or something?’ she asked, sounding drained. Adam shook his head then silently made his way upstairs. He paused on the landing outside Salina’s room. The door stood wide open and he could smell a lingering hint of Salina’s favourite perfume, candy floss mixed with bubble-gum. The room was tidy, shoes organised by colour on their rack, teddy bears and dolls crowding shelves in orderly regiments. Only the duvet appeared slightly rumpled. His mother had lain there last night, clutching Salina’s most recently worn pyjama top. A lump formed in Adam’s throat, sticking like a hard-to-swallow tablet. Adam closed his own bedroom door, letting the familiar chaotic sight sooth him. He sank onto his bed and stared sightlessly at his Winterman comic book poster. The last twenty-four hours had been the worst in his life. He had stood by the lakeside for three hours, watching the emergency services run through their procedures. Various uniformed officers had questioned him before his mother had been allowed to take him home. Then he witnessed her rant and rave for half an hour, going by stages through grief, anger and finally guilt. Eventually, she shut herself in Salina’s room. Adam spent the night crying soundlessly into his pillow and waking from disturbing dreams of his sister floating through an endless void, calling to him for help. Then, this morning, they had to go to the local police station to give his ‘official’ statement. A pair of detectives, a Pakistani man with a gentle voice and a stern blonde woman, had cross-examined him for an hour. No one believed Adam when he told them about the lights, the whirlpool – and the thing that had tried to take him too. They spoke of his sister as if she was dead. Was she? Adam couldn’t bring himself to think it. The tears came again, trickling into his hair. If only dad were here, he would have known what to do. He would have believed Adam. Detective Karen Rainbow rubbed her eyes wearily and glanced at her watch. Karen’s partner, Hussein, sat slumped in the passenger seat of her Ford. Neither of them had been home since the incident at the lake. Supper and breakfast had been lukewarm coffees from a vending machine. The interview with the boy, Adam Phelps, had been unproductive. His story had started off believable, but quickly turned fanciful, fairy lights and sea-monsters, traumatised hallucinations. Mrs Phelps hadn’t helped either, sobbing inconsolably throughout the interview. A soldier by the name of Ryan Scott, recently returned from active duty in Iraq, had drowned trying to save the kids. The lake was on army land and the soldier had been out jogging in the area. His body now lay in the district morgue. Hopefully, the pathologist in charge of the soldier’s autopsy would have some kind of lead for them. Hussein sat up and rubbed his tired eyes. ‘Helicopter, probably. The down-force generated by the helicopter’s propellers must have pushed him under,’ said Hussein, illustrating the effect with his hands. The morgue was situated in Rushdown, a small town ten minutes away from Affrington, separated by a short stretch of country-road. Karen let the speedometer climb to fifty before easing off the accelerator. Green fields, dotted with woolly tufts of sheep, slid by. A specialist CSI unit had been sent down from Manchester, equipped with sonar. The lake had been combed several times. No bodies had been recovered. Karen slowed the car as they entered Rushdown. The road narrowed considerably, congested with cars parked, end-to-end, on either side of the road. The morgue was by far the largest and ugliest building in town. It sat next to a row of regal Victorian houses, a product of bureaucratic design and efficiency. Karen parked up and, together, the detectives walked to the entrance. The automatic door had been smashed in. Fragments of glass littered the reception area beyond. A commotion from within warned that the arsonists were still inside. Karen ran back to her car and began to whisper urgently into her car’s radio-mike. It took Vasch’s warband two nights to cross the gently undulating moors, segmented and divided by wooden gates and stonewalls. They were crossing one of the many glistening black pathways when a huge, armoured creature lumbered out of the night. Berherd had been bringing up the rear. Its single rectangular eye reflected his terror, fiery beams shooting out from its widely spaced nostrils. The beast screeched and slammed headfirst into the warrior. It churned him under its broad discus-shaped legs and then spat out his mangled body. Vasch stood frozen long after the beast disappeared. Berherd’s pack-brother, Durke, was first to stir as a second beast lumbered by and bumped over the corpse. By the time they had retrieved Berherd, there wasn’t much left of him that remained edible. They buried the body in a shallow ditch by the side of the road. Berherd had been with Vasch for three years. In the early hours of the morning, the warband skirted through the cobbled backstreets of a small settlement and dashed across an island of greenery. The orb, clutched possessively in Vasch’s hand, led them straight to their destination. Curly flowing runes, punctuated with occasional straight lines, decorated the temple’s entrance. Vasch ordered Udulf to smash through the transparent doorway. A mournful wail sounded from somewhere within. The warband hunkered down and waited to see if Udulf would die a horrible death. When nothing happened, they made their way inside and destroyed the source of the noise, a small cabinet filled with flashing lights. It gave off a few sparks and then fell silent. The building smelt like a goblin-shaman’s hut, of chicken guts and the sharp tang of sulphuric potions. It was lit harshly by elongated tubes containing white fire, suspended from a panelled ceiling. Vasch could smell something else, something that made his stomach rumble with hunger; dead flesh. Vasch consulted the orb again. This was the place. They would wait here for the prey to arrive. Until then, they would feast. Karen and Hussein had strapped on protective vests and armed themselves with X26 taser-guns from the Ford’s boot. In the distance they could hear a siren fast approaching. The intruders inside the morgue were arguing in a foreign language that neither of them had heard before. Every now and then the burglars would take out their frustrations on the furniture. A dark-blue van screeched to halt by her Ford with the siren still blasting. Four Armed Response Team officers dressed in navy-blue boiler suits jumped out and ran over to join them. They were armed with Heckler and Koch sub-machine guns and Glock side-arms. ‘Great entrance. What’s the plan? Are we going to try taking them by surprise?’ asked Karen. Karen sighed in exasperation and considered pulling rank on the young constable. Hussein patted her on the shoulder and shook his head. No point in arguing. ‘Go, go, go,’ yelled Scholes. Barnes raised his gun and charged in through the door, followed closely by Scholes. A moment later there came two loud bangs followed by the muffled cough of gunfire. Beneath the wings of carrion birds and the shadows cast by feathered arrows, a battle raged between two great hosts. Closer to the ground, the air became thick with meat flies and the stench of maimed bodies. The broken cries of the wounded and the dying were mercifully drowned out by the clash of weapons. Goblins jeered at the alvor and waved their clan totems, staves mounted with animal skulls, hide and feathers. Gillieron, Lord General of the alvorn army, fought fiercely against the first wave. He slammed his leaf-shaped shield into an enemy’s face. The goblin’s eyes glazed over momentarily. Gillieron rammed the goblin a second time and knocked it to the ground to be trampled by its comrades. More goblins pushed forward, their large bulbous eyes, better suited to the twilight of tunnels and caves, narrowed to filter out dust and the sunlight. The goblins were generally a head shorter than the alvor, but their bony frames were ripped with lean muscle and protected by patchwork leather armour. They grinned fiercely as they fought, bearing needle-like teeth from lipless mouths. Their triangular blades and chisel-headed picks rose and fell, tearing flesh and spraying blood. The goblins forced a wedge into the alvorn line, seeking to isolate the general. Gillieron’s shield took a hammering as he held it before him, rallying out from behind its bronze rim with his tapered short sword, which ran dark with goblin-blood. A hand-blade crashed into his shield, splintering the wooden base and twisting its bronze banding. Gillieron countered by ramming his sword up through the goblin’s jaw. He gagged as russet blood spurted on his face, filling his nose with its metallic stench. The goblin fell, twisting away from him, wrenching the sword from his hand. Gillieron threw the broken shield at his enemies and ripped out his sabre, three feet of curved bronze, from its scabbard. He began to lay about him, lopping limbs and shredding armour until his arms grew weary. The goblins fell back. The ground beneath his feet began to rumble with the muted precursor to a cavalry charge. Gillieron could see Captain Quinlan roaring to his pike company to form up ranks at the centre. The goblins cheered as iron-armoured trolls mounted on nicors, wingless dragons native to Kryllon’s wetlands, smashed into the alvorn front line. Gillieron shouted desperately at the archers to provide cover for the infantry to fall back as the pike units were swept aside. The nicors were barded to protect them from the alvorn pikes. Champrons covered their horned heads, with segmented plates protecting their snaking necks and peytral armour for their muscular chests. Sheets of sequoia shafts rained down, but the arrows clattered harmlessly off raised shields and armour. Captain Nenmacil sallied forth at the head of the alvorn cavalry with sabre and lance, hoping to staunch the charge. The alvorn riders managed to unseat a few trolls from their terrible steeds, but many more of their own number fell to the snapping jaws of the reptiles. Nenmacil led the cavalry clear then turned about to attack one more time, smashing into the enemy cavalry’s flank. Blood roared in Gillieron’s ears as wounded troops scurried pass him. The sky suddenly darkened as behemoth clouds rushed together from across the horizon. Lightning crackled, followed by peal after peal of thunder. The battle ground to a halt as combatants turned to look up at the heavens. The animals were first to bolt, as horses shrieked and nicors scrambled on clawed feet for the safety of the forest. Powerful winds beat down. Screams of terror rang out from both sides of the field as the sky tore open. The air howled like a hungry wolf as it rushed up to fill the vacuum. A halo of clouds exploded outwards from the rift in waves, causing the atmosphere to crackle as static energy formed a bolt of pure light and heat. It slammed into the ground. The earth reverberated from the impact, throwing all who stood to the ground. The tear in the sky began to close. Rain lashed down on the colourless strips of grass and the stunted tree trunks that protruded like skeletal fingers from the wasteland. The downpour added to the confusion as the recently firm ground turned to slippery mud. Gillieron got to his feet and stumbled towards the newly formed crater. It was shaped like a sunburst, eight feet across at its widest point. His curiosity overcame his fear and he leaned forward to look. The bodies of four human children lay sprawled at the bottom of the pit. Dear Reader, if you enjoyed reading these first five chapters of The Changeling King, please consider purchasing a copy or ordering the book from your local library. 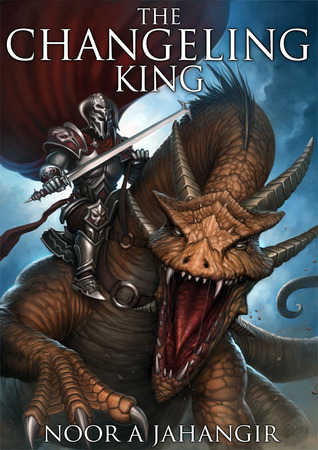 The Changeling King is available in both print and ebook formats from here!